Full function multimeter offers a variety of ranges for every service application, plus Celsius temperature measurement. Rugged overmolded housing stands up to the daily rigors of field service use, and large LCD display is easily read from several feet away. 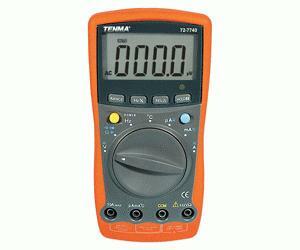 Measures AC/DC voltage, AC/DC current, resistance, capacitance, temperature, frequency and duty cycle. 3 3/4 digit, 3999 count display features 3/4 digits and numerous on-screen icons, for easy at-a-glance reading.